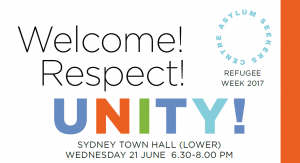 Join the Asylum Seekers Centre and the City of Sydney to celebrate Refugee Week 2017. To attend the Welcome! Respect! Unity! event book now. 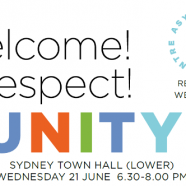 The Asylum Seekers Centre and the City of Sydney invite you to join us for a special celebration of Refugee Week 2017. Tickets only $10, book now to secure your place. Professor Al Muderis, orthopaedic surgeon, author, human rights activist. Dorothy Hoddinott, Principal Holroyd High School. Rosemary Kariuki-Fyfe, Baulkham Hills African Ladies Troupe. Cr Jess Scully, City of Sydney. Frances Rush, CEO Asylum Seekers Centre. Hosted by Julia Baird, ABC The Drum, journalist and author. Young refugees from renowned Treehouse Theatre who will share personal stories on the circumstances that brought them here. The evening will be a celebration of the incredible contribution that refugees and asylum seekers make to Australia.